Measure your wrist or a bracelet you already own if you are not sure about the correct size. The average bracelet size is between 7 and 8 inches. The bracelets with a lobster clasp fit almost anyone, since they include an extension for larger wrists. Would you like to design your own charm bracelet? Choose your bracelet and add the charms. The bracelet designer will allow you to move your charms freely on the bracelet and design the bracelet right from your home. The designer adds the charms, bracelet, and the assembly fee to your cart! Making the process faster and more efficient! 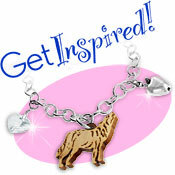 Explore the possibilities and enjoy your custom bracelet building experience from Charm Factory! – no assembly required on your part – and includes a free gift box! Bulk Chain, also known as Chain by the Foot, is great for jewelry designers or hobbyists who make their own custom bracelets, necklaces, anklets and more. We carry a wide variety of.925 sterling silver chain styles. Chains come in 12 inch increments, and your order will usually come in one continuous length. Beading chain is great with crystals or our message beads.